BMW’s impressive, indoor-track dominated hall featured the Vision hybrid concept car. Adrian van Hooydonk’s design rotated on display as Efficient Dynamics liveried cars from BMW’s lineup sailed past. How cool to have your own track to display and drive right in the exhibition hall ! As we moved over to the Mini stand we could hear some tasteful V8 sounds emanating from above us, proving that there was more to BMW’s display than showing their efforts to control emission outputs and improve efficiency. At the heart of their future eco-plans lies the hybrid chassis that the Vision’s aggressive yet svelte bodywork was draped over. Does this mark a swing away from BMW’s plans for hydrogen fuelled cars? Remember the 7 series hydrogen that was being produced on a limited trial basis. Certainly, the whole eco-car movement has pushed towards hybrids and pure electrics, rather than hydrogen, unless in fuel celled cars. Fuel density and transport problems are mostly responsible, and the convenience of converting existing engine technology which was already looking cynical. We like the principles enshrined in BMW’s philosophy: eco-cars that retain performance and driving pleasure by cutting down weight, and kinetic and aerodynamic losses. But we do question the weight penalty of carrying around a turbodiesel as well as electric motors. This is still intermediate technology to make the all-important range acceptable to ordinary car users. Lose the combustion engine and it’s electric generator and think how much weight you could save. The world still needs a more efficient battery, despite recent advances. 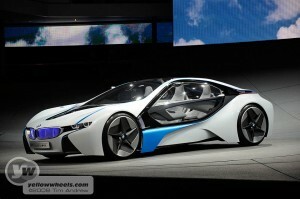 The BMW Vision EfficientDynamics is BMW’s most innovative concept car ever and sets a new performance car agenda. Its unique powertrain, ground-breaking performance potential and exo-skeletal style bodywork crafted from aerodynamic knowledge gained in Formula One set it apart from anything previously seen. Powered by a three-cylinder turbo diesel engine and two electric motors, the BMW Vision EfficientDynamics is capable of BMW M3 performance but with a fraction of that model’s CO2 emissions and far greater fuel economy. The striking concept car is showcased with a powertrain producing an anticipated 356hp and 800Nm of torque for true supercar performance. However, the vehicle has been designed to be capable of recording 75.1mpg on the combined cycle and CO2 emissions of 99g/km. The vehicle’s impressive performance figures improve further when it runs solely in hybrid mode. When taking the sources of electrical energy generation into account the CO2 emissions of the BMW Vision EfficientDynamics drop to a staggering 51g/km*. The BMW Vision EfficientDynamics highlights a number of technologies that will appear on BMWs of the near future. BMW’s Air Curtain system that channels air through a front valance with the air exiting ahead of the front wheel is fitted. The Air Curtain system’s exiting air flow effectively deflects air from entering the wheel arch and causing turbulence thus improving all round performance. 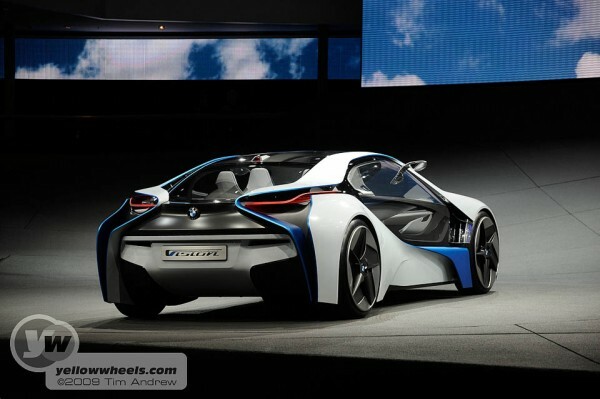 The bodywork of the BMW Vision EfficientDynamics also takes styling cues from the marque’s involvement in Formula 1. The exo-skeletal appearance of elements of the design mean the vehicle cleaves through the air with the least possible resistance. The drag co-efficient is 0.22 – the lowest figure of any BMW road car. The subtle folds of the bodywork that sit proud of the passenger cocoon create downforce without the need to have large spoilers. The 1.5-litre three-cylinder turbocharged diesel engine is another feature that indicates production potential. In isolation this new engine is capable of recording peak power of 163hp, a new record in terms of output per litre at 109hp, and a peak torque of 290Nm. Mounted transversely and ahead of the rear axle, the diesel engine can be the sole power source for the vehicle or it can work in conjunction with the electric drive. Alternatively the diesel engine can be used to charge the electric drive battery pack. 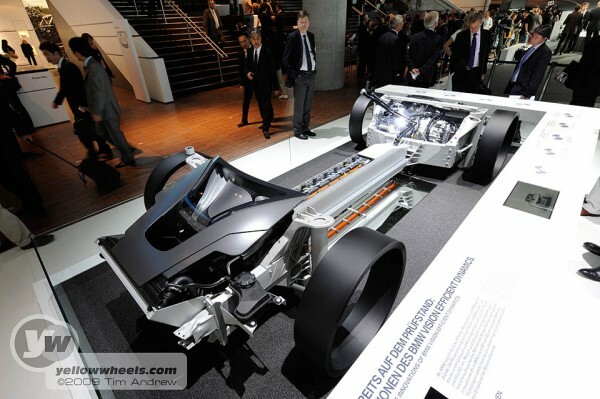 The hybrid drivetrain features two electric motors – one on each axle. At lower speeds just the electric drive mode functions. The rear axle motor can produce up to 38kW of power and 290Nm of torque, while the second axle motor is capable of 60kW and 220Nm of torque. However, an overboost function allows the driver to top this up to 84kW for a 30 second boost and 104kW for a 10 second power enhancer. When taking all three power sources into account these figures equate to a car that records a peak power of 356hp and torque of 800Nm. Power is transmitted to the road via an enhanced version of BMW’s existing seven-speed Double Clutch Transmission. The BMW Vision EfficientDynamics has a range of 31 miles when driving only on electric mode. Combined with the three-cylinder diesel engine this extends to a total possible distance between fill-ups and charges of 431 miles. Using a conventional domestic power source at 220 V would result in the vehicle being fully recharged after 2.5 hours. Access to a slightly more powerful 380 V sees the charge time drop to 44 minutes. Unlike other hybrid vehicles that use existing vehicle architecture and then add a hybrid drivetrain, the BMW Vision EfficientDynamics isn’t penalised by weight. A V8 or larger capacity engine that would be the norm for a supercar has been substituted by a compact three-cylinder engine and two electric motors. This is fitted to an aluminium chassis to further save weight. The result of this is that the vehicle tips the scales at just 1,395kgs. The use of low rolling resistance tyres has also taken on another twist to offer something unique. Normally customer demand for larger alloy wheels with wider tyres is at odds with aerodynamic and rolling resistance targets. However, BMW engineers working with Michelin developed a solution to this conundrum. The contact patch of the BMW Vision EfficientDynamics has effectively been turned 90 degrees by virtue of specifying larger diameter wheel rims. Larger, but thinner tyres result in the same percentage of rubber being in contact with the road, but the cross section of the tyre as a whole is smaller making for less rolling resistance and greater aerodynamic efficiency. BMW is renowned for using lightweight materials as part of its EfficientDynamics strategy and this concept car is no different. The chassis and suspension are made entirely from aluminium while the roof and the outer skin of the doors are made of a lightweight polycarbonate glass. This material also comes with special properties that allow the glass to darken in sunlight to keep the cabin temperature at the desired level. The BMW Vision EfficientDynamics also showcases BMW’s Thermo Electric Generator currently fitted to the exhaust system of test cars and being developed for production. This works on the principle of the Seebeck effect to generate an electrical current courtesy of the temperature change between two metal based semi-conductors. This system alone generates enough charge to power some of the auxiliary features. Inside, and the 3D Head-up Display is another feature that highlights at possible production car capability as does a new incarnation of iDrive with a touchpad screen. The vehicle’s 4.6 metre length, 1.9 metre width and 1.24 metre height permit a 2+2 configuration that makes this supercar a practical form of transport. With the rear seats folded the BMW Vision EfficientDynamics even has room for two sets of golf clubs that can be stowed in the 150-litre luggage area. 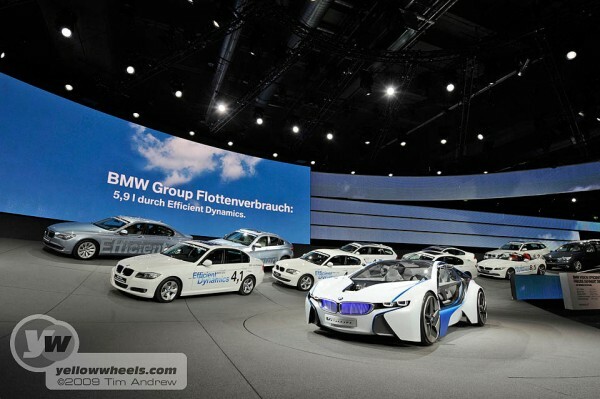 The BMW Vision EfficientDynamics is the centrepiece of the BMW stand at the Frankfurt Motor Show. More images and video footage of this model and other new products at the show can be seen at www.bmw-web.tv. The BMW Vision EfficientDynamics won’t be the only star in Frankfurt, the new BMW 320d EfficientDynamics Saloon, currently the marque’s lowest CO2 emitting model at 109g/km, will debut. Joining this model will be the BMW 5 Series Gran Turismo, the BMW X1, the BMW X5 10-Year Anniversary Edition and new engine introductions into existing model line-ups such as the BMW 118d Coupé and 120i Coupé. *If the car drives under just electric power CO2 emissions (tank to wheel) are actually 0g/km. However, if the electric power comes from a European power station emitting an average of approximately 290g CO2 / kWh, electric consumption by the car of 17.5kWh/100km means well to wheel emissions are 50.75g/km (17.5 x 290 ÷ 100 = 50.75).